Gemma Chan has a gorgeous sense of personal style. Here’s how to get her elegant vibe yourself. We’ve seen Gemma Chan stun in Crazy Rich Asians, Captain Marvel, Humans and so many other amazing films and shows, but her style off screen is just as amazing. Gemma epitomizes the off duty model look and blends in just a touch of classy yet effortless, almost regal influence in her style. 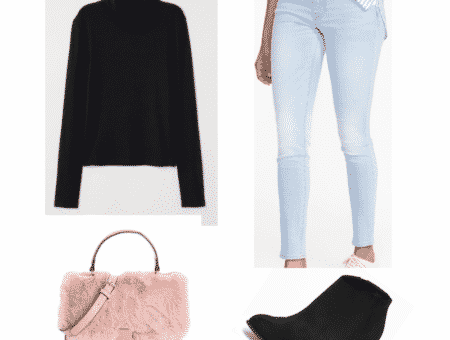 Today, we’ve created a capsule wardrobe inspired by Gemma Chan’s vibe. Check it out below! Like her character Astrid from the book and movie Crazy Rich Asians, Gemma’s day to day style can be encapsulated in one word: elegant. Form-fitting or flowy can describe almost all of these pieces; nothing is particularly skin tight or revealing. The colors, although in some cases bright, would never be overwhelming enough to take away from the person wearing the clothes! Lastly, although patterns can be fun, to imitate Gemma’s daily style as accurately as possible while also keeping it simple, I’ve opted for block colors that complement one another well. 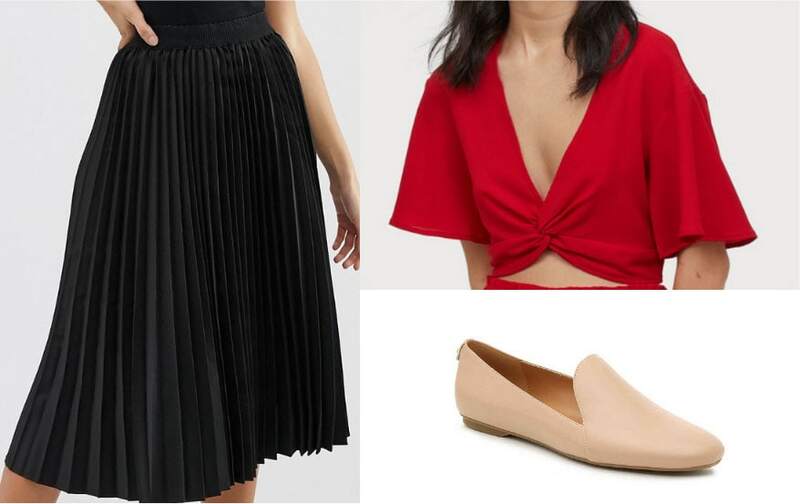 This outfit mimics Gemma’s street style; the midi length skirt would suit her long legs, and paired with it, the flowy deep red top is the perfect length to go with it! The cuts are similar in that they would both adjust to complement any body shape while maintaining the effortless, ethereal vibe Gemma is so well known for. Lastly, a staple: beige loafers. They’re comfy, cute and super chic! This jumpsuit is one of my favorite pieces, and definitely something we would catch Gemma wearing to dinner with friends, or to a more casual event! The cut of the jumpsuit is flattering in every way possible; the open knees show a little skin, while the neckline flatters while barely revealing anything. Gemma is 5’9″ and often opts for flats; being from England herself (Kent specifically) this pair of white loafers is perfect for her style! What I love about this outfit is that while it looks fantastic, it incorporates only items that almost everyone owns! 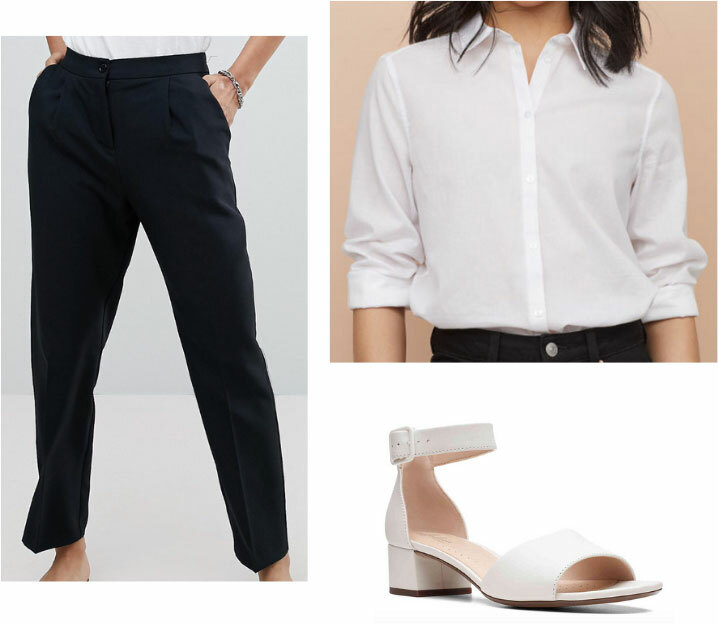 A simple button-down shirt, fitted black pants, and a light/white low heel is a fantastic go-to classy outfit for almost any occasion! It strikes the perfect balance between smart and casual while maintaining the “I didn’t even try” look. I recommend wearing this to a class on a dressier day; maybe for a presentation, or if you have someone somewhat important to meet but still don’t want to look overdressed throughout the rest of the day! This look is perfect for a day out on the town, anytime you need to walk a lot but still want to look super cute, or just a super simple brunch outfit to throw on on a Saturday morning! The bright colors make it a mood-changing happy outfit too, so if you’re feeling a little down, this might cheer you up a bit. 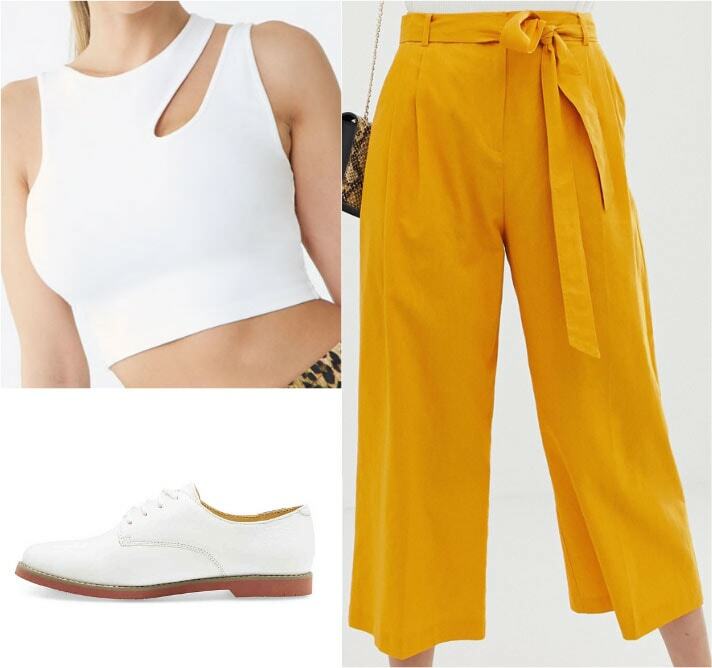 What makes this outfit stand out (aside from the striking but slightly dull yellow) is the simple cut on the left shoulder; it’s so simple but makes such a difference and adds edge to what would otherwise be a plain outfit. This kind of subtle tweak is definitely up Gemma’s alley! Lastly, this pairing is perfect for a night out when you’re feeling a bit lazy or just don’t have time to put anything elaborate together. The lace romper honestly speaks for itself; it’s classy and edgy and feminine and all in one, and a plain, comfy, flat shoe with it only adds to the effortless look. I personally love all the detailing in the romper — the sheer outline to an already intricate and delicate pattern adds even more elegance to a classic little black look. As a standalone piece, this romper makes a statement just like many things we’ve seen Gemma wear before! What do you think of Gemma Chan’s style and wardrobe? 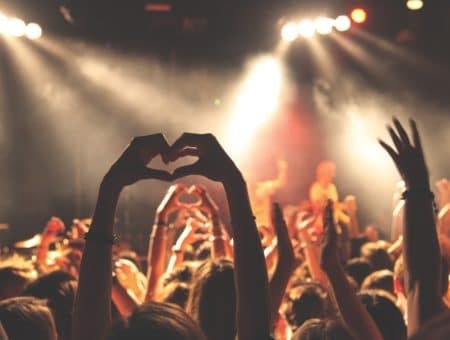 Gemma Chan is not only a style icon, but a great role model in life too; she studied law in Oxford, has had an extremely successful career in the entertainment industry, and did it all on her own. She rallies for inclusion and is someone whose traits we can all learn a little something from; personally I admire her ability to maintain poise in every situation! Do you have a favorite Gemma look? What’s your favorite role that she has played? Let me know in the comments below! Gemma Chan has a gorgeous sense of style. 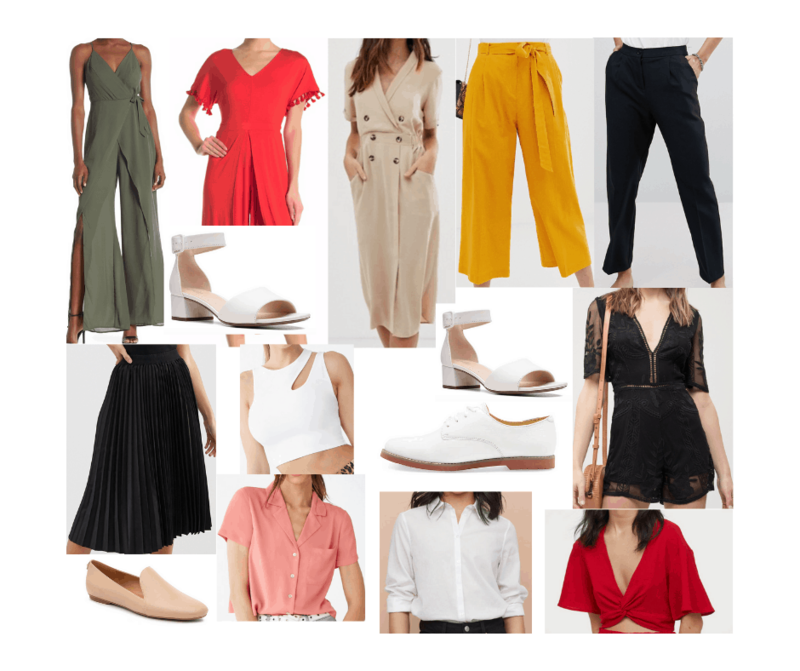 Here are the pieces you need to copy her day to day wardrobe, plus five outfit ideas to get you started.